We look forward to welcoming you to your Ibiza Retreat at Can Amonita! At the bottom of the page is a small map with the Sat Nav coordinates. 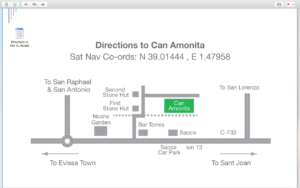 Here are the directions to Can Amonita from the airport. From airport – stay on main road to Santa Eularia (PM810), going north, then after about 8 km look for “Cepsa” fuel station on left. Take first left after the fuel station (it is a sharp turn that almost goes back on itself). Drive over little bridge to T junction at the end of the road. There is a Suma shop / supermarket on your right and a lot of road works. Drive right on to the San Juan road, which is being resurfaced. Proceed north for about 3 KM past Ashfelt works (on left), then after about 400 meters further look for Bar Torres on left. Turn left immediately at Bar Torres drive up the camino (bumpy track) which bends right and then left and continues gently up hill, keeping big fields to your right, until you come to a small stone hut with a wooden door. Take this right turn and drive uphill until you reach a big set of black iron gates – this is Can Amonita – please park inside the gates on your left or right.